Many people ask me ‘what’s a day in your life look like?’ (And by many I mean someone asked me once and I multiplied it by 100). I think a lot of people envision shop owner as the girl behind the counter, spending her days selling the pretty things in her shop. To be honest, this is what I envisioned that I would do when we opened up in 2011. I had NO idea of the work that it would take to run the shop. Bryan was going to continue his wedding photography and I would run the shop. I’d like to stop for a hot second and pat sweet Kendi of 2011 on the head. Running a business by yourself? that. is. not. going. to. happen. A lot goes into making bloom work. B and I both come from retail backgrounds, B has corporate retail on his side and I have a range from being shop girl at a mom and pop boutique in college to managing social, email and print advertising for a jewelry company. It’s quite nice to have the mix of corporate and mom and pop. We needed every bit of experience we had and together it all works. So, now what is it that I do all day? I’ve wanted for a long time (two years now) to write more about bloom but when I sit down to write a whole series out I become stumped. But today it was too cold to take photos outside and coat ruined by outfit, so I thought let’s just take them in bloom. Then I thought let’s talk about it, let’s talk bloom today. I say let’s make this a series, yeah? I don’t know everything, but I know what I know and I’m happy to share it with you in following posts. So friends and future entreprenuers, what would you like to know? Love the new blog format; it’s very classy! I like this feature, it’s nice to get a peek into your career outside of the blog. I would love to know. When you first opened your shop, how did you market it and get people interested in it, in the store and buying your products. I am always interested to know the secrets of a small business. Thanks for sharing Kendi! does Bryan get to do any photography at all (aside from your FAB blog photos)? does he miss it or is it all the right mix? LOVE the new format too! Love this outfit all over. Yes, I would love for you to do a series on this. I’ve always wanted to start a clothing shop, and it would be helpful to learn all of the work that goes into it. Your shop looks great! Wish I lived in TX so I could visit! Yay! I’ve been waiting to hear about Bloom and how it runs for 2 years! When you say you go between Kendi Everyday and Bloom, what does that mean? What does Kendi Everyday entail? Besides writing blog posts (I promise I am not trying to minimize anything you do, just curious). Also I love the stripes and flowers combo! What were the things you had to do before having a brick and mortar place? Cute outfit! I’m interested in knowing the merchandising side of Bloom.. how do you discover new items to bring into your shop? love love love love your pattern mixing here!!! I love everything about your outfit! And hats off to you for owning your own shop, I’ve worked in retail and it isn’t anything easy! How much work is it to have an online shop? This is a great idea. I have no idea what I want to know, but I want to know it. It’s nice to see what you do, and how you do it. Or anyone’s day-to-day, for that matter. LOVE that you’re sharing more of this as opening an online store (no thank you brick and mortar and actually TALKING to people) has been a dream of mine and more so now with having a blog. Would love to know about your buying techniques and strategies, what a social messaging campaign really is (as we all sort of have one but I’m sure yours is in more detail). When you first started blogging, how did you get people to follow your blog everyday, and also just to learn about your blog in general? Thanks for being so dang lovely! I look up to you, always! thanks for this! so much insight. it’s a dream of mine to open my own shop one day and i realize it’s super hard but this got me a little more excited about it! i definitely need to find a partner though. hubs is good with math and can do the books but i need someone to bounce creative ideas off of 🙂 you’re a rockstar! It is hard at times, but you know what? so are a lot of things. Don’t look at it that way, set small goals and achieve those first then move on down your to-do list. Start with a business plan, start with your ideas of what you’d carry or what the shop would look like, etc. Don’t worry about the workload, it’s a lot somedays but it’s NOT impossible or their wouldn’t be any boutiques. Amen! If your dreams dont scare you, they arent big enough! My hubs and I (married less than 2 months) are going into business together. couldnt be more excited, but yes, scared would be another word to describe it! Love this post. Your outfit is adorable. Ooh such a great idea… how about balance between real life and blog life? Real job and blog job? I would love to hear about that! How you manage to fit it all in and still look like you’ve slept 8 hours. The shop looks adorable and I love your outfit. Oh and I want that leopard coat hanging on the wall behind you… I don’t see it on the website. I think you will sell more items by taking shots inside to be honest. I would love to hear all about Bloom. So share away!! Omg so many questionssss! I apologize in advance as this may be a long comment! I’ve actually just started my own e-commerce boutique, coincidentally in partnership with my (now) finance – so far he hasn’t had any second thoughts on that decision, at least I think, haha! – While my store is a modern & vintage consignment business and the way I gain inventory is different from a traditional retailer I would love to hear more about how you connected with suppliers and built up your inventory when you first started out. Also, in terms of promoting the store, I know you have your blog, but are there any other tactics you would suggest for a newly budding store owner? Thanks so much for sharing, Kendi! I love hearing about how you manage it all. I would like to know what experience you think is necessary to running your own business. It sounds like something I’d like to do but have little/no experience in retail or business, haha. I’m also loving the shop/outfit pictures! I really enjoyed this post. I work with my husband in one business although we both have full time jobs and then part time fun jobs. (He plays in a few bands and I blog.) It’s good to know that everyone who does their own business has a little bit of that hectic scheduling and some of the bickering too (even though that parts no fun). I look forward to reading more. This look is pure perfection! And what an uncanny time – my girlfriend Whit and I were talking about what a dream it would be to own a boutique together, but said we had no idea where to start or what it took. Great inspiration!! I really enjoy reading this post! It’s nice to kind of hear about the behind the scenes! I think this is my favorite of your outfits ever. I love those colors together! I absolutely freakin’ LOVED this! thanks so much for sharing! I can’t wait for more in this series. As a twenty-something about to buy and operate a business with my husband, sister in law, and brother in law, I’d love to hear more and more about just life as a business owner. I know that’s pretty broad, but just anything you have to saw, in addition to not giving up, and how to get through the messes. Great post, thanks for sharing! I would love to read about your transition from the 9-5 to being a full-time business owner. Did you save up a ton beforehand? If so, how long did it take you? I’m sure you took out business loans in the beginning to get started…what sort of plan did you make to manage those? Did you have a time in your life when the 9-5 and your shop overlapped, if so how did you manage your time? Sorry, lots of questions. I have been aimlessly selling artwork online for a few years and recently started getting serious about the business end of things. This month I opened a newly branded paper goods line. I’m working my tail off, and honestly am still figuring out how to be successful at my job and my business at the same time. With so little time to devote to my business, some days it feels like I’ll never really get there. I’m glad for the list of questions! It’s helpful to know where to go with this series, so thank you. Hi! I love this series. This is probably a no-brainer question, but where do you find the clothing to sell on your online shop? If it is going to be unique and different from other shops, where does it come from? How do you find new inspiration? I am excited for this series. Your shop is lovely!! I’d love to own a bridal shop one day. The question I keep going back to over and over and over again is…. how in the world do you get the money to start?? I..just..don’t know….. I love this post. How true that you simply can’t run any business by yourself. It takes a small army! enjoy reading this, i always wonder how people run their blogs/business. Series would be great, anything you’d like to write about it, thank you :-). Love love your blog Kendi! My dream job is to own a boutique. I’m wondering your buying process for the store. How do you find vendors, pick items for the next season, etc? I LOVE this post! I’ve always wanted to know more about bloom. I definitely vote a series on it:) I’d love to know how you got the shop started financially, what your timeline was like (how long were you dreaming of this before taking action, how long did it take to do your business plan, find a location, fix up the location, take home a paycheck, etc.). What was your business plan like – a novel with a ton of research or a short guideline? How did you find your location – did it tick off all the boxes on your wishlist and are you happy with it now, after two years? I’d love to hear the process of making your dream a reality. How you made your dream of bloom the business it is today. How you go about figuring out what you have to do! I absolutely love when you write about the behind-the-scenes of running Bloom. I’ve always wondered how you decide what to buy for the shop every season. How often are you changing inventory and how do you decide on this cadence? Is there a science behind how much/little to stock per item as well? It’s really interesting to read the story behind your shop! Also, I love the combination of floral & striped shirts – very cool! yes yes, more posts about bloom, please! It is a stunningly pretty little shop, from the few photos you have shared. On another note, I am also enjoying the re-design of this blog! though would you consider making the italic font a size larger? it’s a bit hard to read at the moment. Or just take out italics as a whole, that would also be great. I found it very difficult to read today. Thank you for this post!! I have been following your blog for a while now and you have truly become an inspiration for me. I have big dreams of quitting my corporate america job and opening up a boutique. I just recently started an online boutique also incorporating pop up shops around town on the weekends and after work. I love how you said it’s fun work and you enjoy doing every element of the business because that is totally me! Although, I wish I could do it all day, every day. How did you find the courage to quit your job, follow your dreams and also find the feasible way to do it? Thank you again for sharing! I loved reading this! More behind the scenes posts please and more photos in the shop – they are more personal to you. I love this post! 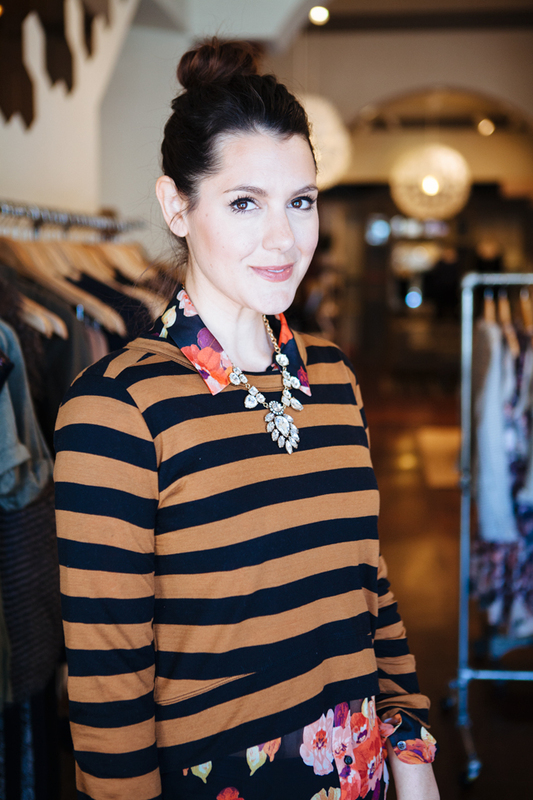 My eventual goal is to open up my own store, so I love this – and congrats on your success! I would love to know more about the process you had to go through to start up. My biggest question would be about start up capital. Once you had your vision, your business plan, how did you pitch it to someone for financing? Was it a bank loan? How did you develop a budget? How did you decorate the space while being cost-efficient? I’d love to hear more about the financial side and that planning. I look up to you a lot for blending your creative/fashion side with your business sense- it’s something I hope to do one day as well. I’m so glad you wrote about this! I’m starting my own photography business and the “idea” of what it’s like is usually always there…plus tons and tons of work (which isn’t always the glamorous side). Thanks for sharing! It’s inspiring and I would love for this to be a regular part of your blogging! Awesome post Kendi, and you look gorgeuous! Awesome post Kendi, and you look gorgeous! 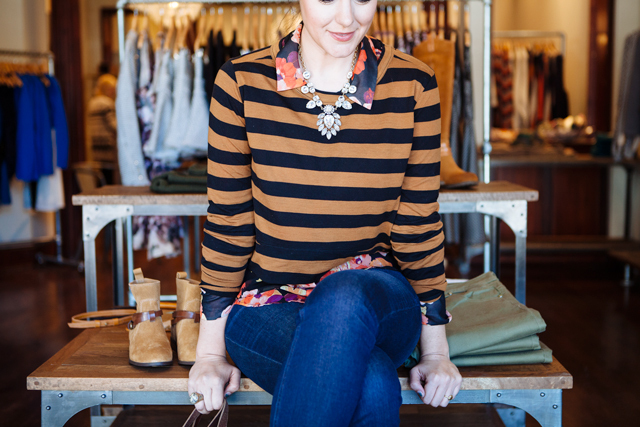 Love the layered outfit with the stripes and floral together, and love hearing more about Bloom! I had no idea there would be so much to think about and do while running your own business – it’s so great you have a wonderful team behind you helping! 🙂 And your store looks lovely. Love this, love the idea of getting a behind the scenes look at what it takes to run a shop. (Sounds like a loving hubby is a necessity) And your shop is so gorgeous! What an incredible job you’ve done! I want to see more pictures of your shop! Did you pay an interior decorator to design it all? 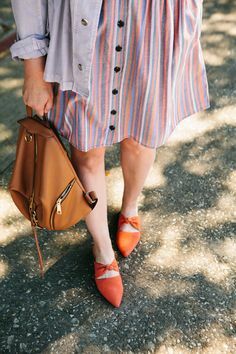 Love the stripes and floral! Awesome necklace! your store is filled with amazinngggg stuff 🙂 and love that outfit! This is such a cute outfit, I love how you layered a slightly cropped shirt with a floral blouse, so chic! Admire how well you seem to handle such a demanding business, look forward to the rest of the series! Yes! More Bloom! I’m hoping that “shop owner” is in my someday future, so I’ll take all that I can get as far as advice. Did you get a bank loan? If yes- how much? (50% of start up costs, etc) Has it been easier/harder to pay back than you thought? I’m guessing you are profitable by now…but how long did it take? These pictures are gorgeous! Your shop is so beautiful too! Love hearing what goes into a days work 🙂 Would love to add this to my resume someday as well! Love, love this outfit combination. love it! One of many reasons I follow your blog is because you are honest and you keep things real. Sometimes when standing in front of my closet I ask “what would Kendi wear” and if all else fails colored pants and stripes is the answer. Keep on rockin’ girl. Also I noticed you made top 30 boards to follow on TIME…congrats! But had no idea you were a SHEEN! lol someone should tell them you are Skeen and not Sheen! She made what board? Can you post a link? I love hearing a bit more about your journey and also ow you break up the work (how you came to decide having a store manager and online manager etc.) and even more about how you and your husband tackled this project together. That’s amazing. Also, I love both the outfit and seeing your beautiful store. love this little insight into your shop life. I have thought, and thought about opening a boutique but my area is just not right for it. best of luck with everything and I love the new design! your journey is amazing, i’m happy for your success! Thanks for this post – I love hearing about it all! I’ve always loved the idea of having my own business and am inspired to hear about Bloom. love this little glimpse into your business :). Great post Kendi! My hubby and I are planning to tart a business too and I am so fearful of failure and losing our investment. They say most business are not in the black for a couple of years. So glad to see great business owners like you! What made you do decide to take the plunge? For us, I think we would still need to keep our day job since we are looking at a franchise for hair cutting and I think it would be just enough to pay the bills and a little payback. Love these kind of posts on your blog. Totally gives a whole other side to you..keep ’em coming girl! I admire you so much for going after your dream, and incorporating your husband in it as well 🙂 Bloom looks like an AMAZING store – I hope to make my way over there someday to say hello! I also love, love, love your outfit! And the new layout!! It’s my dream to open a shop one day. I love hearing about the realities! I love hearing about bloom!!! Looking forward to upcoming shop girl posts! I started my business 3 years ago and I just had to laugh at your musing about patting your 2011 self on the head haha! Been there!! Almost daily, something comes up that I handle sooooo differently from when I first started. I was naive. Ernest and passionate, but blissfully naive. That said, there is a different kind of bliss that comes when you realize you’re learning, flexing and growing. Kudos Kendi!! Love this series. Can’t wait to read more. Thanks for sharing this. Inspiring. Still dreaming of owning my own business someday soon. Love the new blog design…not the “read more”though. Now I have to click multiple times whenever I’m reading thru more than one post. OH NOOOOOO! Please don’t start the “click here to read more” stuff. Argh, I’m with you on that one, dislike. But looooooove seeing your shop, and OH MY I’m in love with the stripes + floral (that stripe top is perfection but I only want it if I can have the floral one too, sigh). Honestly, I have no question YET as your blog is a break from case studies prep (interviewing starts Thursday and I fly out to London tomorrow for 2 weeks of mayhem yikes)! But I do have a good amount of questions that I will be throwing out to you as I too want to start a business of my own eventually and I think some of the skills you’ve acquired are the type of skills anyone needs. Thanks. I hope Bloom will grow to be a bigger success. (Are you thinking of) Will you open more Bloom shops in Texas and in other states in a few years? 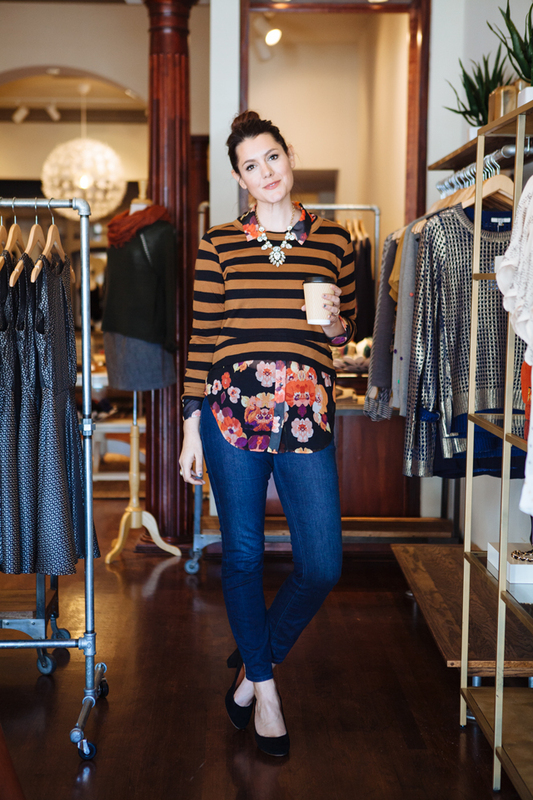 I love this post, it’s a great look into your adorable store! I’d certainly be interested in seeing more in this series. But I also agree with Lauren, I am really not a fan of the “click here for more” and now when I try to read your blog on my iphone bloglovin app (the only way i usually read blogs) it doesn’t show your whole post. A major pain. I’m so thankful for this post! As someone who runs their own business with the help of her fiance (and vice versa — I help him with his business too! ), it feels so good to read that you also fought with your husband in the beginning. Maybe that’s horrible to say, but it helps so much knowing I’m not alone in trying to figure out how to have a professional and intimate relationship with the same person. I’m hoping one day that I will be able to open a shop as lovely as yours. I would really love to know what the very first step you took in opening the shop. I’m so lost when it comes to thinking of how to get started. I feel like my lofty dreams will always be just that — dreams. How did you turn yours into reality?? Love this bloom series! I’ve always wanted to ask you about this. Please keep it coming! Loved this post! So interesting to hear what really goes on when running your own shop. Thanks for being so real, and I can’t wait to hear a bit more! Seriously in love with this! Love the colors and mixture of patterns! aw, bless your sweet little heart. you’re a-frickin-dorable! oh my gosh, THIS is your shop??! it’s beautiful!! i can’t wait to hear more…i am trying to figure out what to ask! LOVED reading this, please share what pushed you to finally go for opening bloom? Love the new blog format; it's very classy! I like this feature, it's nice to get a peek into your career outside of the blog. I would really like to know how/when/what inspired you to start blogging and open up Bloom. I loved this post! Very insightful! Yes, I would love for you to do a series on this. I've always wanted to start a clothing shop, and it would be help to learn all of the work that goes into it. Your shop looks great! Wish I lived in TX so I could visit! Yay! I've waiting to hear about Bloom and how it runs for 2 years! When you say you go between Kendi Everyday and Bloom, what does that mean? What does Kendi Everyday entail? Besides writing blog posts (I promise I am not trying to minimize anything you do, just curious). Cute outfit! I'm interested in knowing the merchandising side of Bloom.. how do you discover new items to bring into your shop? I love everything about your outfit! And hats off to you for owning your own shop, I've worked in retail and it isn't anything easy! This is a great idea. I have no idea what I want to know, but I want to know it. It's nice to see what you do, and how you do it. Or anyone's day-to-day, for that matter. LOVE that you're sharing more of this as opening an online store (no thank you brick and mortar and actually TALKING to people) has been a dream of mine and more so now with having a blog. Would love to know about your buying techniques and strategies, what a social messaging campaign really is (as we all sort of have one but I'm sure yours is in more detail). thanks for this! so much insight. it's a dream of mine to open my own shop one day and i realize it's super hard but this got me a little more excited about it! i definitely need to find a partner though. hubs is good with math and can do the books but i need someone to bounce creative ideas off of 🙂 you're a rockstar! How you manage to fit it all in and still look like you've slept 8 hours. The shop looks adorable and I love your outfit. Oh and I want that leopard coat hanging on the wall behind you… I don't see it on the website. I think you will sell more items by taking shots inside to be honest. I opened and online store and online store and I’m still trying to figure everything out. Hopefully it works out. Congratulations on your 2 years with bloom! It is hard at times, but you know what? so are a lot of things. Don't look at it that way, set small goals and achieve those first then move on down your to-do list. Start with a business plan, start with your ideas of what you'd carry or what the shop would look like, etc. Don't worry about the workload, it's a lot somedays but it's NOT impossible or their wouldn't be any boutiques. Perfect, Perfect, Perfect Post. Thank you for opening up about not only bloom, but all of the little details that go into the every day! Your blog, led me to your online store which eventually led me to visiting the shop itself just a few weeks ago, all of which were the groundwork for inspiring a dream in me to one day open my own shop. So, a huge thank you for that! Ok, this is what I do, go on & on.. To the point! What I would like to know: a) what was the most difficult “thing” say 2.5 years ago as you were getting ready to open bloom? And b) if its not too personal can you give any financial advice regarding opening your own shop? How much of a small business loan is a good amount, how much in savings to kick start etc etc. thank you miss Kendi for your ever genuiness. I've actually just started my own e-commerce boutique, coincidentally in partnership with my (now) finance – so far he hasn't had any second thoughts on that decision, at least I think, haha! – While my store is a modern & vintage consignment business and the way I gain inventory is different from a traditional retailer I would love to hear more about how you connected with suppliers and built up your inventory when you first started out. Thanks so much for sharing, Kendi! I love hearing about how you manage it all. I would like to know what experience you think is necessary to running your own business. It sounds like something I'd like to do but have little/no experience in retail or business, haha. I'm also loving the shop/outfit pictures! I really enjoyed this post. I work with my husband in one business although we both have full time jobs and then part time fun jobs. (He plays in a few bands and I blog.) It's good to know that everyone who does their own business has a little bit of that hectic scheduling and some of the bickering too (even though that parts no fun). I look forward to reading more. I’ve been planning to open a store forever but don’t have the guts to take the plunge.Help! I really enjoy reading this post! It's nice to kind of hear about the behind the scenes! I absolutely freakin' LOVED this! thanks so much for sharing! I can't wait for more in this series. As a twenty-something about to buy and operate a business with my husband, sister in law, and brother in law, I'd love to hear more and more about just life as a business owner. I know that's pretty broad, but just anything you have to saw, in addition to not giving up, and how to get through the messes. Great post, thanks for sharing! I would love to read about your transition from the 9-5 to being a full-time business owner. Did you save up a ton beforehand? If so, how long did it take you? I'm sure you took out business loans in the beginning to get started…what sort of plan did you make to manage those? Did you have a time in your life when the 9-5 and your shop overlapped, if so how did you manage your time? Sorry, lots of questions. I have been aimlessly selling artwork online for a few years and recently started getting serious about the business end of things. This month I opened a newly branded paper goods line. I'm working my tail off, and honestly am still figuring out how to be successful at my job and my business at the same time. With so little time to devote to my business, some days it feels like I'll never really get there. I'd love to own a bridal shop one day. The question I keep going back to over and over and over again is…. how in the world do you get the money to start?? I..just..don't know….. I love this post. How true that you simply can't run any business by yourself. It takes a small army! Thanks for being an inspiration and sharing your life with all your readers! enjoy reading this, i always wonder how people run their blogs/business. Series would be great, anything you'd like to write about it, thank you :-). Love love your blog Kendi! My dream job is to own a boutique. I'm wondering your buying process for the store. How do you find vendors, pick items for the next season, etc? I'm glad for the list of questions! It's helpful to know where to go with this series, so thank you. I LOVE this post! I've always wanted to know more about bloom. I definitely vote a series on it:) I'd love to know how you got the shop started financially, what your timeline was like (how long were you dreaming of this before taking action, how long did it take to do your business plan, find a location, fix up the location, take home a paycheck, etc.). What was your business plan like – a novel with a ton of research or a short guideline? How did you find your location – did it tick off all the boxes on your wishlist and are you happy with it now, after two years? I'd love to hear the process of making your dream a reality. How you made your dream of bloom the business it is today. How you go about figuring out what you have to do! I absolutely love when you write about the behind-the-scenes of running Bloom. I've always wondered how you decide what to buy for the shop every season. How often are you changing inventory and how do you decide on this cadence? Is there a science behind how much/little to stock per item as well? This is exciting. It sounds like a lot of us share the same dream! Of course a lot of want to know financials (cost of setting up the online store?) but that may be too personal. One question I am hoping you can answer is: How often do you get new inventory and how does this process work exactly? Do you decide everything at tradeshows or is it more on a month to month basis? It's really interesting to read the story behind your shop! Also, I love the combination of floral & striped shirts – very cool! yes yes, more posts about bloom, please! It is a stunningly pretty little shop, from the few photos you have shared. On another note, I am also enjoying the re-design of this blog! though would you consider making the italic font a size larger? it's a bit hard to read at the moment. Thank you for this post!! I have been following your blog for a while now and you have truly become an inspiration for me. I have big dreams of quitting my corporate america job and opening up a boutique. I just recently started an online boutique also incorporating pop up shops around town on the weekends and after work. I love how you said it's fun work and you enjoy doing every element of the business because that is totally me! Although, I wish I could do it all day, every day. How did you find the courage to quit your job, follow your dreams and also find the feasible way to do it? Thank you again for sharing! Love the new look of the blog. Also love reading and viewing your blog! My biggest question would be about start up capital. Once you had your vision, your business plan, how did you pitch it to someone for financing? Was it a bank loan? How did you develop a budget? How did you decorate the space while being cost-efficient? I'd love to hear more about the financial side and that planning. I look up to you a lot for blending your creative/fashion side with your business sense- it's something I hope to do one day as well. I'm so glad you wrote about this! I'm starting my own photography business and the "idea" of what it's like is usually always there…plus tons and tons of work (which isn't always the glamorous side). Thanks for sharing! It's inspiring and I would love for this to be a regular part of your blogging! 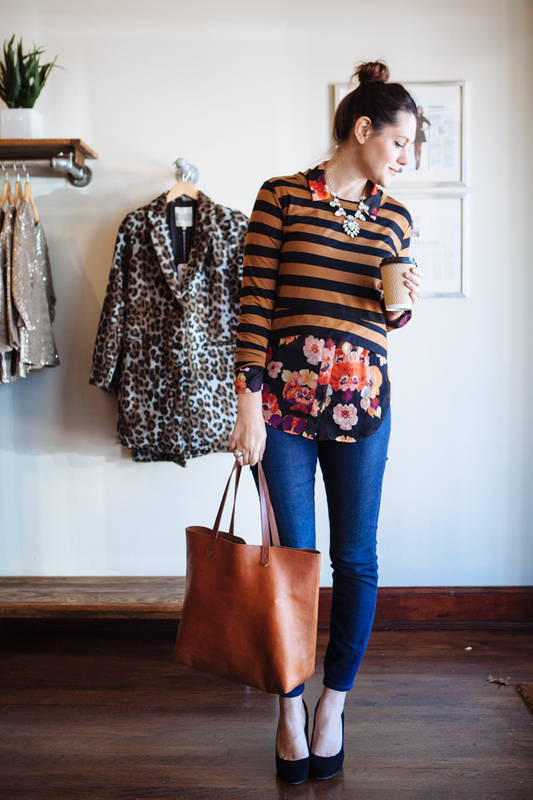 Love the layered outfit with the stripes and floral together, and love hearing more about Bloom! I had no idea there would be so much to think about and do while running your own business – it's so great you have a wonderful team behind you helping! 🙂 And your store looks lovely. Love this, love the idea of getting a behind the scenes look at what it takes to run a shop. (Sounds like a loving hubby is a necessity) And your shop is so gorgeous! What an incredible job you've done! Yes please!! I’d love to hear more about Bloom and running a business! Yes! More Bloom! I'm hoping that "shop owner" is in my someday future, so I'll take all that I can get as far as advice. Did you get a bank loan? If yes- how much? (50% of start up costs, etc) Has it been easier/harder to pay back than you thought? I'm guessing you are profitable by now…but how long did it take? Loved this post! A series all about Bloom would be amazing! Keep these posts coming! Adore this. I love seeing your journey and highs and lows and it’s really inspiring. You go girl!! Happy you have a store mgr, that’s gotta take a load off! Love the outfit too, I’m inspired to restyle my cropped sweatshirt w a blouse now. I would love to hear more about bloom! I am so fascinated with your store as I have always dreamed of owning a store of my own. To be honest I have store envy after watching you’ve got mail! I would love a boutique or homewares or florist store but have not got the guts or know how to open one. I would love to hear your story, struggles and all and hope to find my own courage! A little world and place of my own! First things first – this outfit, yes. I have been wearing all black to work lately just because.. I'm honestly too tired. But this has given me some inspiration! I love, love, love this new series though. I have just started my career in retail as an Assistant Manager for a large corporation. I am enjoying getting the experience now, but eventually would like to run my own store. I went to school for fashion merchandising, but still feel like I'd be starting from scratch. I would love for you to continue with this series! Thank you so much for writing this! It is really cool to see a little inside your business. I also love the floral/stripe combo. It’s daring and I love it. love it! One of many reasons I follow your blog is because you are honest and you keep things real. Sometimes when standing in front of my closet I ask "what would Kendi wear" and if all else fails colored pants and stripes is the answer. Keep on rockin' girl. Also I noticed you made top 30 boards to follow on TIME…congrats! But had no idea you were a SHEEN! lol someone should tell them you are Skeen and not Sheen! Story of my life…;) SO happy to hear that I’m not alone working so closely with my significant other AND being in the boss role. ;D Your honestly is refreshing. I am in such awe of you. You are a generous, funny blogger (and no doubt, human). Always engaging and fun, Kendi Everyday and Bloom look like great places to be. your journey is amazing, i'm happy for your success! Thanks for this post – I love hearing about it all! 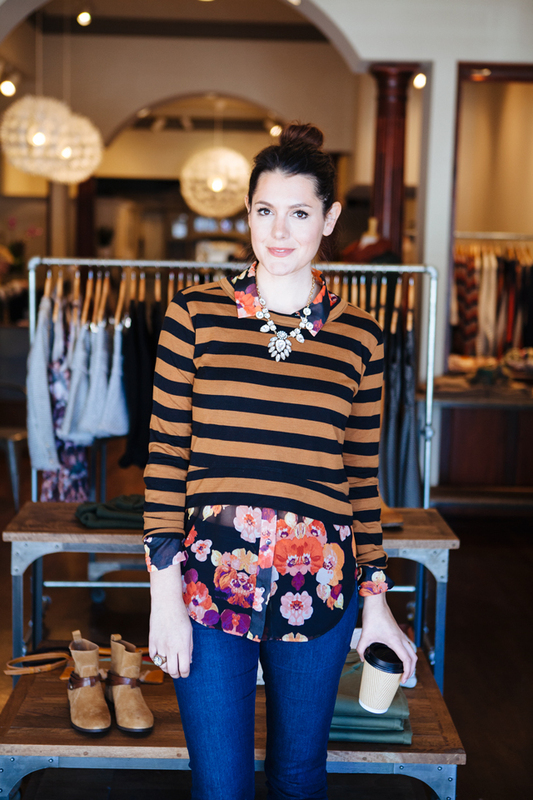 I've always loved the idea of having my own business and am inspired to hear about Bloom. Love these kind of posts on your blog. Totally gives a whole other side to you..keep 'em coming girl! It's my dream to open a shop one day. I love hearing about the realities! I started my business 3 years ago and I just had to laugh at your musing about patting your 2011 self on the head haha! Been there!! Almost daily, something comes up that I handle sooooo differently from when I first started. I was naive. Ernest and passionate, but blissfully naive. That said, there is a different kind of bliss that comes when you realize you're learning, flexing and growing. Kudos Kendi!! Love this series. Can't wait to read more. Thanks for sharing this. Inspiring. Still dreaming of owning my own business someday soon. Love the new blog design…not the "read more"though. Now I have to click multiple times whenever I'm reading thru more than one post. OH NOOOOOO! Please don't start the "click here to read more" stuff. Honestly, I have no question YET as your blog is a break from case studies prep (interviewing starts Thursday and I fly out to London tomorrow for 2 weeks of mayhem yikes)! But I do have a good amount of questions that I will be throwing out to you as I too want to start a business of my own eventually and I think some of the skills you've acquired are the type of skills anyone needs. Thanks. 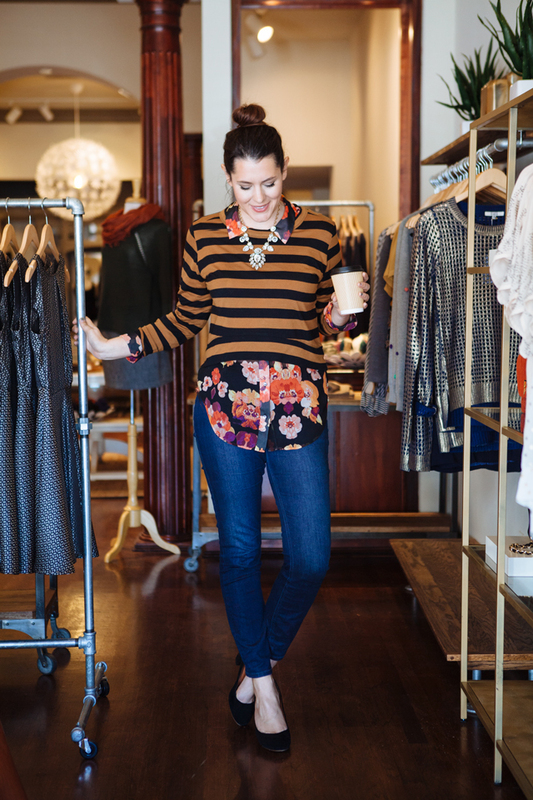 I love this post, it's a great look into your adorable store! I'd certainly be interested in seeing more in this series. But I also agree with Lauren, I am really not a fan of the "click here for more" and now when I try to read your blog on my iphone bloglovin app (the only way i usually read blogs) it doesn't show your whole post. A major pain. I'm so thankful for this post! As someone who runs their own business with the help of her fiance (and vice versa — I help him with his business too! ), it feels so good to read that you also fought with your husband in the beginning. Maybe that's horrible to say, but it helps so much knowing I'm not alone in trying to figure out how to have a professional and intimate relationship with the same person. I'm hoping one day that I will be able to open a shop as lovely as yours. I would really love to know what the very first step you took in opening the shop. I'm so lost when it comes to thinking of how to get started. I feel like my lofty dreams will always be just that — dreams. How did you turn yours into reality?? Love this bloom series! I've always wanted to ask you about this. Please keep it coming! Loved this post! So interesting to hear what really goes on when running your own shop. Thanks for being so real, and I can't wait to hear a bit more! aw, bless your sweet little heart. you're a-frickin-dorable! oh my gosh, THIS is your shop??! it's beautiful!! i can't wait to hear more…i am trying to figure out what to ask! So excited about this series! I want to know how you started out… how did you figure out where to buy? Who did the interiors (besides your dad, of course)? I can't wait to read all about it! Argh, I'm with you on that one, dislike. But looooooove seeing your shop, and OH MY I'm in love with the stripes + floral (that stripe top is perfection but I only want it if I can have the floral one too, sigh). I opened and online store and online store and I'm still trying to figure everything out. Hopefully it works out. Perfect, Perfect, Perfect Post. Thank you for opening up about not only bloom, but all of the little details that go into the every day! Your blog, led me to your online store which eventually led me to visiting the shop itself just a few weeks ago, all of which were the groundwork for inspiring a dream in me to one day open my own shop. So, a huge thank you for that! Ok, this is what I do, go on & on.. To the point! What I would like to know: a) what was the most difficult "thing" say 2.5 years ago as you were getting ready to open bloom? And b) if its not too personal can you give any financial advice regarding opening your own shop? How much of a small business loan is a good amount, how much in savings to kick start etc etc. I've been planning to open a store forever but don't have the guts to take the plunge.Help! Yes please!! I'd love to hear more about Bloom and running a business! Adore this. I love seeing your journey and highs and lows and it's really inspiring. You go girl!! Happy you have a store mgr, that's gotta take a load off! Love the outfit too, I'm inspired to restyle my cropped sweatshirt w a blouse now. I would love to hear more about bloom! I am so fascinated with your store as I have always dreamed of owning a store of my own. To be honest I have store envy after watching you've got mail! I would love a boutique or homewares or florist store but have not got the guts or know how to open one. Thank you so much for writing this! It is really cool to see a little inside your business. I also love the floral/stripe combo. It's daring and I love it. Story of my life…;) SO happy to hear that I'm not alone working so closely with my significant other AND being in the boss role. ;D Your honestly is refreshing. Love the new site look, LOVE the outfit, and super excited about this series. I love to hear about how small businesses are run (daily challenges, highlights, etc) so I’m literally up for anything! It sounds/looks like you’ve done such a wonderful job with the shop Kendi, you go girl! Not only are you Superwoman, but you look great doin’ it as well. If you could do a post going in more depth about you and B figuring out the best way to work together. I also have a Bryan…maybe it’s the namesake, but boy do they think they know everything! I started my photography business fresh out of college after getting my art degree, B gives his inputs based on his biz marketing degree, but 99.9% of the time it ends in a fight. Just a few insights or tips or what not to do’s would be awesome. You rock my socks and I’m so happy for all of your success. Your normalcy is so refreshing! You are a hard worker in all your roles, and you look fab too!! I love the floral blouse under the stripped sweater but that leopard coat in the background is awesome! I so admire your entrepreneurial spirit and how hard you work. It really is an inspiration to someone like me who at this point in my life has decided to start my own venture outside of the corporate environment. Posts like this really help me to believe that I can do it! I so wish I had the kahoonahs to do this! I would love to be my own boss, be creative, leave corporate america behind! I know it’d be hard but I think it’d be worth it. I probably never will but I will live vicariously through you! Love this post! Always like little sneak peaks inside other business owners crazy days! You are to fun and Bloom is something to be so proud of! Kendi, this is so great that you shared all of this. It is really cool to learn about how you successfully became who you are today. You really do have a great blog, and if I lived closer, I would totally be in Bloom very often! Thank you for being you and continuing to inspire everyday! Running a boutique is so much more little, daily stuff that I never thought would end up taking SO much time. My biggest struggle right now is planning out sales, event, markdowns. How do you go about this? Thank you SO much for sharing more about your business! I’d love to hear more about how you found the right location, what was important to you in that regard both creatively and from a business/traffic standpoint; do you travel to find your inventory? How do you find resources for wholesale that you love? Any info on how to get started would be really interesting, too (concept, paperwork, loans, vendors, how you handle online, etc.). Can’t wait to read more! P.S. I’m in love with the dark floral blouse! My absolute favorite outfit post to date! Great proportions, amazing pattern mixing, beautiful colors. Good hair and some nice jewels to boot! The store looks lovely too! thanks so much for sharing! My husband and I plan to open a business together one day… and we only have one car. Good to know that was a struggle for you guys! I would like to know, how long did it take you before you decided to hire employees? And what’s been your most successful advertising endeavour? Connecting with the downtown committee and other businesses? Having an online shop? How do you decide what to stock, and have you ever been surprised by something? Like you got something you knew was going to fly off shelves but it didn’t, or vice versa? Do you ever struggle with impostor syndrome? It seems like maybe a little, since you said you’re not truly comfortable with the title of boss. Just wondering if you ever have issues with it- if so how it affects you, and how you get over it. Love the new site look, LOVE the outfit, and super excited about this series. I love to hear about how small businesses are run (daily challenges, highlights, etc) so I'm literally up for anything! I love this! Thanks for sharing! I love the pictures, I so wish I could visit your store. Been waiting for this post FOREVER! I loved hearing about the behind-the-scenes stuff, and thank you so much for your honesty with the hard work (and the fights) that it took along the way. It’s really refreshing! It sounds/looks like you've done such a wonderful job with the shop Kendi, you go girl! Not only are you Superwoman, but you look great doin' it as well. If you could do a post going in more depth about you and B figuring out the best way to work together. I also have a Bryan…maybe it's the namesake, but boy do they think they know everything! I started my photography business fresh out of college after getting my art degree, B gives his inputs based on his biz marketing degree, but 99.9% of the time it ends in a fight. Just a few insights or tips or what not to do's would be awesome. You rock my socks and I'm so happy for all of your success. Kendi! Thank you SO much for posting this blog! I have been seriously considering opening a boutique myself but 1) don’t have the courage, 2) don’t know where to start. I love that you want to share what you can/know with us. It makes me feel a little less overwhelmed when the ideas start to flow. When and what made you decide to become a store owner? How long did it take you to get started (beginning the planning to opening your doors)? And how long did it take for you to feel established (really feel your store was making money and making people feel good and want to shop there)? My favorite outfit of 2013!!! I love your posts and store! Wish I lived there so I could come visit – or even apply for a job haha! I so wish I had the kahoonahs to do this! I would love to be my own boss, be creative, leave corporate america behind! I know it'd be hard but I think it'd be worth it. I probably never will but I will live vicariously through you! Love hearing about your day and how you work for yourself. It’s so obvious you work so hard to do something your passionate about. I love that your husband is so onboard and supportive of your creative side. It’s really amazing. Thank you SO much for sharing more about your business! I'd love to hear more about how you found the right location, what was important to you in that regard both creatively and from a business/traffic standpoint; do you travel to find your inventory? How do you find resources for wholesale that you love? Any info on how to get started would be really interesting, too (concept, paperwork, loans, vendors, how you handle online, etc.). Can't wait to read more! P.S. I'm in love with the dark floral blouse! thanks so much for sharing! My husband and I plan to open a business together one day… and we only have one car. Good to know that was a struggle for you guys! I would like to know, how long did it take you before you decided to hire employees? And what's been your most successful advertising endeavour? Connecting with the downtown committee and other businesses? Having an online shop? How do you decide what to stock, and have you ever been surprised by something? Like you got something you knew was going to fly off shelves but it didn't, or vice versa? Do you ever struggle with impostor syndrome? It seems like maybe a little, since you said you're not truly comfortable with the title of boss. Just wondering if you ever have issues with it- if so how it affects you, and how you get over it. Been waiting for this post FOREVER! I loved hearing about the behind-the-scenes stuff, and thank you so much for your honesty with the hard work (and the fights) that it took along the way. It's really refreshing! Kendi! Thank you SO much for posting this blog! I have been seriously considering opening a boutique myself but 1) don't have the courage, 2) don't know where to start. I love that you want to share what you can/know with us. It makes me feel a little less overwhelmed when the ideas start to flow. When and what made you decide to become a store owner? How long did it take you to get started (beginning the planning to opening your doors)? And how long did it take for you to feel established (really feel your store was making money and making people feel good and want to shop there)? Love hearing about your day and how you work for yourself. It's so obvious you work so hard to do something your passionate about. I love that your husband is so onboard and supportive of your creative side. It's really amazing. You look beautiful. Working at the mall is stressful in itself, I cannot imagine owning the boutique! Like the site redesign overall, though the font is a little small. Enjoyed the peek into Bloom! Love the look of the site redesign but it’s a bit tedious to have to click read more for all the posts. One of the things I liked about the design before was that you can just scroll through all the recent posts/photos. Perhaps this is the epitome of a “first world problem” but it’s not as handy to have to individually open the ones you want to read. But I love your blog, and these glimpses into the day-to-day are always interesting. This couldn’t have come at a better time for me! I’m thinking about opening my own store also and I am definitely interested in this post becoming a series. I’d love to know everything you can think of sharing. I’ve been following your blog for 3 years now and I’ve “witnessed” the making of Bloom and ALL the planning that went into it. I don’t expect it to be easy and wouldn’t like it that way either…anyone can take on easy projects. I’ll enjoy hammering at it and would appreciate a glimpse of your experience and lessons learned. Lots of love! Great post! The store looks nice and I love your floral blouse! Love the look of the site redesign but it's a bit tedious to have to click read more for all the posts. One of the things I liked about the design before was that you can just scroll through all the recent posts/photos. Perhaps this is the epitome of a "first world problem" but it's not as handy to have to individually open the ones you want to read. You read my mind! I’ve always been super jealous of your situation, but at the same time realistically knew it must be sooooo so so much work to run your own business. I would love to see this turn into a series. A question always lingering on my mind is, how do you know what pieces will work for the gals who live in your region? Versus what you see in Vogue versus what you see on fashion blogs of girls who live in LA or NYC? I’ve always been interested in that. Oooh love this look! 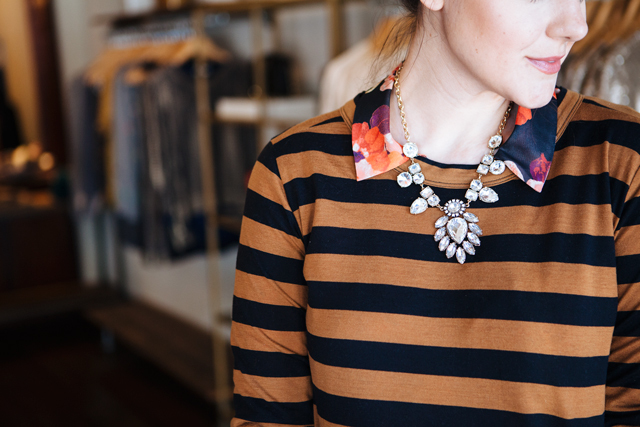 The floral & stripes combo, so beautiful and polished! What an awesome story, btw… very inspiring! I want to know how you started, and how you found start-up capital. I have been interested in starting my own business for a while, but this is the part that scares me. Start up money!! Need help in that department. What are the first steps to starting a store? I adore this outfit! And I’m so excited to read this new series. I’ve always wanted to open a shop of my own, but I know its VERY hard work, and that intimidates me. It’s something I think about doing down the road, not right now. So I’d love to hear all of your expert knowledge! Seriously, love that outfit, one of my favorites you’ve posted. i’m always so excited to know more about your life…in the non-creepiest way possible, i swear. i want to know more about buying, and about the idea generation for your social messaging. also, i’d love to see what your shop/the row your shop is on looks like during christmastime! and, i hate so much to ask, but is there any way you’d consider changing your body font back to regular, instead of italic? i know that seems like a silly thing for a girl to ask a blogger, but it’s so overwhelming and hard to read, and i want to be able to take in every word! HI! I totally agree with you. I mean about the italic. (Well and with the rest too 🙂 ) Italic look great, but in larger texts it is less easy-reading than regular. And currently on my screen the lettering is a bit jagged (frayed? shaky? — I am not a native speaker so I have hard time describing it properly… the lines are not clean). I second the font change back to normal instead of italic.. I find it hard to read. As for being a shopkeeper that is so neat to figure out what you do! You read my mind! I've always been super jealous of your situation, but at the same time realistically knew it must be sooooo so so much work to run your own business. I would love to see this turn into a series. A question always lingering on my mind is, how do you know what pieces will work for the gals who live in your region? Versus what you see in Vogue versus what you see on fashion blogs of girls who live in LA or NYC? I've always been interested in that. I adore this outfit! And I'm so excited to read this new series. I've always wanted to open a shop of my own, but I know its VERY hard work, and that intimidates me. It's something I think about doing down the road, not right now. So I'd love to hear all of your expert knowledge! Seriously, love that outfit, one of my favorites you've posted. i'm always so excited to know more about your life…in the non-creepiest way possible, i swear. i want to know more about buying, and about the idea generation for your social messaging. also, i'd love to see what your shop/the row your shop is on looks like during christmastime! and, i hate so much to ask, but is there any way you'd consider changing your body font back to regular, instead of italic? i know that seems like a silly thing for a girl to ask a blogger, but it's so overwhelming and hard to read, and i want to be able to take in every word! Beautiful! I love the striped top. It’s really nice to know more about a shop owner’s routine (and a successful one). The shop looks amazing! I wish I could shop there. It's really nice to know more about a shop owner's routine (and a successful one). The shop looks amazing! I wish I could shop there. Where can I find a coat like the one in this blog post: http://atlantic-pacific.blogspot.com/2013/01/dark.html? I realize this isn’t a question about Bloom or running a business, but I’m dying to find this coat!!! I am so in love with your outfit here it’s not even funny! And thanks for your post about a day in the life of Kendi. I fantasize regularly about quitting my job and running a clothing store. Where can I find a coat like the one in this blog post: http://atlantic-pacific.blogspot.com/2013/01/dark.html? I realize this isn't a question about Bloom or running a business, but I'm dying to find this coat!!! I am so in love with your outfit here it's not even funny! And thanks for your post about a day in the life of Kendi. I fantasize regularly about quitting my job and running a clothing store. 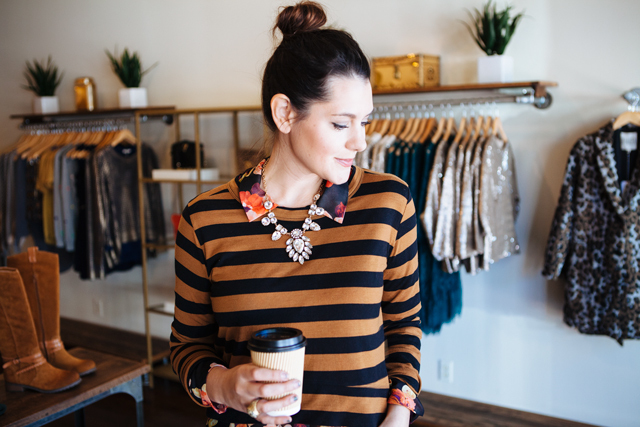 This is such a great outfit and a great read too learning how your started your business! Yay! Love that you’re sharing about Bloom. So proud of you and all that you’ve accomplished, sweet friend! I own a new shop in Brooklyn, NY (about 2 months old) and it has been a dream. However – i’m 25 and none of my friends/people I know own their own business. So it’s difficult to truly understand the ins and outs, what to prepare for, what I may be missing/doing wrong. Hi Sarah! what’s the name of your shop! I live in Brooklyn and would love to visit! Yay! Love that you're sharing about Bloom. So proud of you and all that you've accomplished, sweet friend! I own a new shop in Brooklyn, NY (about 2 months old) and it has been a dream. However – i'm 25 and none of my friends/people I know own their own business. So it's difficult to truly understand the ins and outs, what to prepare for, what I may be missing/doing wrong. Thanks for sharing all of this! Could you start talking about accounting and how you learned how to maintain the legal aspect of your businesses? Thanks! Hi Sarah! what's the name of your shop! I live in Brooklyn and would love to visit! What a wonderful little peek into everything that’s evolved over the past few years — the idea of running a boutique definitely tends to sound glamorous, but I can’t even imagine the amount of work and planning and detail that goes into it. Looks like you’re doing it well though and I can’t wait to hear more! What a wonderful little peek into everything that's evolved over the past few years — the idea of running a boutique definitely tends to sound glamorous, but I can't even imagine the amount of work and planning and detail that goes into it. Looks like you're doing it well though and I can't wait to hear more! I loved this post! I love your honesty. That you didn’t make it all smoke and mirros about starting and running your own business. That means a lot to those of thinking/dreaming of opening one! I have always wanted a boutique, but would really love a childrens bookstore. How would I compete with the big names…Barnes & Noble, Amazon…. Not sure that I can. Any advice for someone living in a larger city looking to something quaint and speical? I loved this post! I love your honesty. That you didn't make it all smoke and mirros about starting and running your own business. That means a lot to those of thinking/dreaming of opening one! I have always wanted a boutique, but would really love a childrens bookstore. How would I compete with the big names…Barnes & Noble, Amazon…. Not sure that I can. Any advice for someone living in a larger city looking to something quaint and speical? I’m just curious about running your own business. What is a part that you didn’t anticipate liking so much? And what is the hardest part? I love hearing about the behind the scenes of bloom…. you keep it real girl. And yup, are one seriously adorable shop gal to boot! Enter my Gigi New York tote giveaway! I'm just curious about running your own business. What is a part that you didn't anticipate liking so much? And what is the hardest part? Absolutely love the outfit and thank you for sharing!! Great to hear. This was such a thoughtful post, and so timely for me in this moment. I’m having a fabulous (ok, not so fabulous) quarter-life crisis where I’m trying to figure out what I want to do with my life. It was so inspiring to read about the process that you and Bryan went through, both the ups as well as the downs. Thank you for sharing! This was such a thoughtful post, and so timely for me in this moment. I'm having a fabulous (ok, not so fabulous) quarter-life crisis where I'm trying to figure out what I want to do with my life. It was so inspiring to read about the process that you and Bryan went through, both the ups as well as the downs. Thank you for sharing! This may seem random BUT where did you find your LOVELY store fixtures? in particular the second last photo- the rolling rack and the fixtures along the wall? I own a shop on the East coast of Canada and it is REALLY hard to find such things! I’d love it if you could let me know- if it is something you don’t everyone to know i also understand 😉 We shop owners must keep some things secret! This may seem random BUT where did you find your LOVELY store fixtures? in particular the second last photo- the rolling rack and the fixtures along the wall? I own a shop on the East coast of Canada and it is REALLY hard to find such things! I'd love it if you could let me know- if it is something you don't everyone to know i also understand 😉 We shop owners must keep some things secret! I’m so glad you finally shared details about your shop, I’ve been curious for ages! Also very interesting to read a “day in the life” of yours, I love stuff like that. I don’t know how you do it all and still look so fabulous! I have always wanted to own a clothing store of my own, and your insight on how much more it is than just standing behind the counter. I am very inspired by your post and still have the dream of owning my own shop! okay. okay. this is totally inspiration for me to keep sending out my resume. I need to start my career so I can recreate some of these hot office looks you have going on. So cute.